In this article I will explain you the steps to convert Dataguard to Read Write mode. I have explained you to open in synchronized dataguard in Read only mode as Active standby in the Following article. In this article, I will tell you how to convert Dataguard to write Read Write mode and then to convert it into dataguard mode again. Flashback must be turned on in order to be able to active standby mode. To enable Flashback, we need to use the FRA parameter like following. Flashback is enabled as follows. This can be done in case the dataguard is off and in mount mode. Create a guaranteed restore point. When we convert to dataguard, we will use this restore point. Manually create an archive log in the primary database like following. We need to delay the redo transport from the Primary Database to the Standby database. So disable related log_archive_dest_state_2 parameter like following. Now we can activate the Standby database and convert it into Read Write mode. We opened the standby database in Read write mode namely Snapshot database mode. This operation is done such as test or Disaster purpose. If Disaster tests or any other tests are completed, we can convert it into dataguard again like following steps. 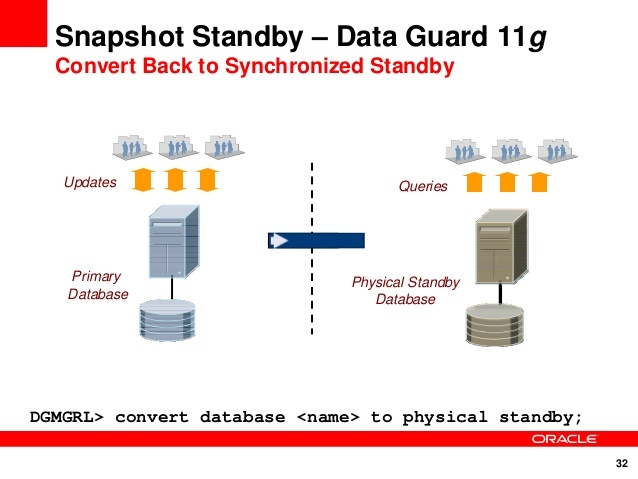 Convert Snapshot database to the standby database. The Standby database is reopened in Mount mode. Redo Apply is started again like following.